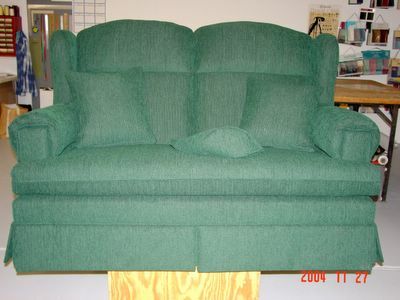 Since this loveseat was only 4 years old, the customer chose to go with a simple reupholster job. In addition we built her a firmer seat cushion core. It now sits firmer and will look good for many years to come. We like to replace ALL seat cushion cores, because after they have been in the old covers for years, they develop a "set" and loose their ability to expand correctly and fill out a new cover. Yes, we can make the cover smaller, but then the cushion will wrinkle, have a poor shape after used for awhile and will be to small for the seat opening.